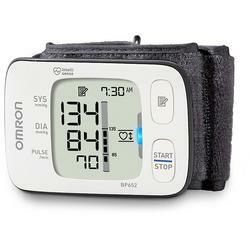 The Omron® 7 Series Wrist Blood Pressure Monitor (BP652N) offers convenience, portability and accuracy. With Heart Guide Technology, the device automatically activates when you wrist is at heart level to ensure an accurate reading. The 7 Series wrist monitor also features a two user mode to allow you to store readings for you and one other person. Heart Guide Technology - Heart Guide Technology automatically activates when your wrist is at heart level, ensuring consistently accurate readings. Flashing orange and blue indicator lights help guide your wrist to your heart level, making it easier to find the correct position. Slim Portable Design - New slim design is more discrete and convenient for portability, allowing users to monitor their blood pressure at home, work or anywhere. Irregular Heartbeat Detector - This monitor can detect and alert you to irregular heartbeats while your blood pressure is being measured. Advanced Averaging - Exclusive technology automatically displays the average of up to the last 3 readings taken wtihin the last 10 minutes.